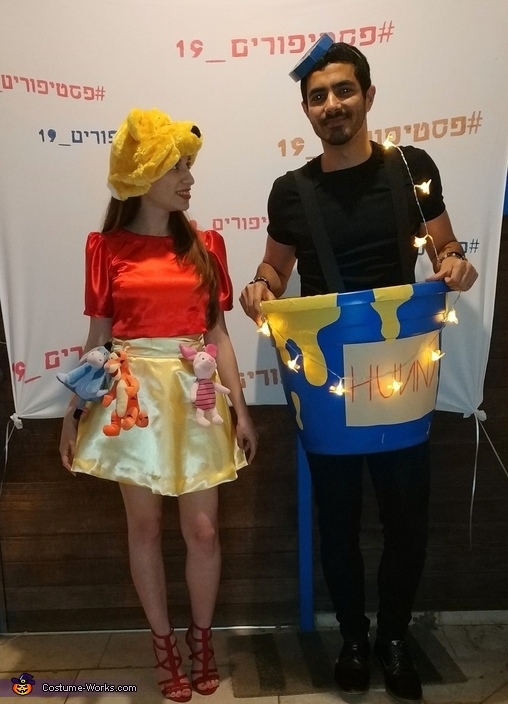 My boyfriend and I wanted to involve led lights in our costume, we have found online bee shape led lights which works using batteries and we came up with the following couple costume idea. I bought the hat in Christmas market, I sewed the costume from red and yellow sateen fabric, the skirt is made from yellow sateen fabric and yellow tulle underneath. To complete the look, I bought the toys in the toy store near my house and I bought red shoes. * plastic flower pot, which we dyed in blue using a blue spray, cut using a knife the bottom of it and attached using rubber bands. We were a hit at the costume party! Hope you got inspired and you will have fun with this costume!